At first it seems simple. You want to explore the iconic Galapagos islands—the incubator for Darwin’s belief-shattering research. 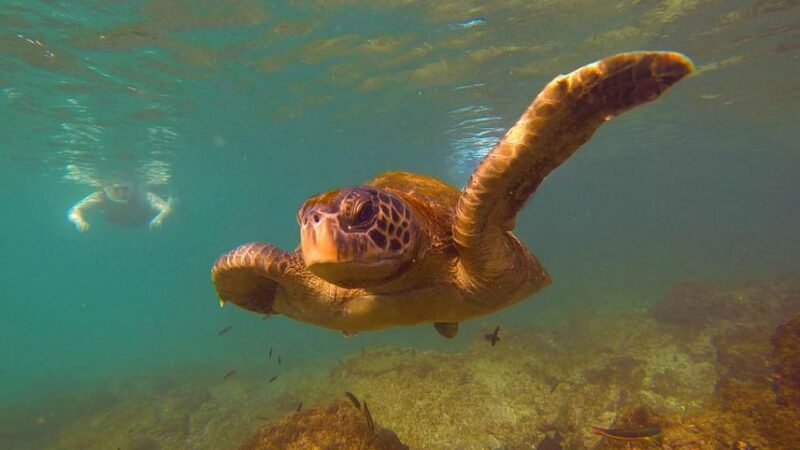 You find a flight and a hotel and plan to see everything from giant tortoises to playful sea lions. 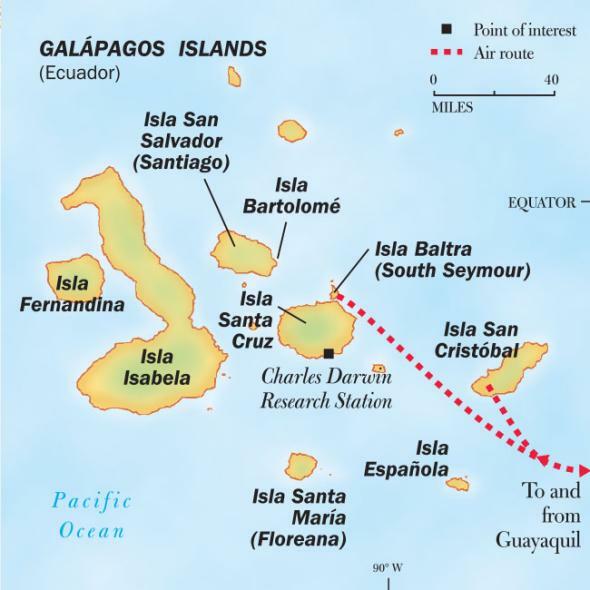 What you may not realize is that the Galapagos has two faces and you may have just locked yourself out of what you wanted to do. Map credit to National Geographic Expeditions. In the Galapagos archipelago only the main islands of Santa Cruz, San Cristoból have hotels, shops, airports, and commercial harbors. Almost everything else is part of the heavily restricted national park marine reserve. In order to protect the precious animal, there are limits on the number of people who can visit each landing site per day. Hotel guests compete for these limited spaces and can only access a few of the more than 70 locations. Traveling to the nature preserve requires bouncing in speed boats for several hours each way with few amenities. There are no restrooms, shade, or restaurants on the national park islands—the ones that tell the real story of these rare and renown animal populations. 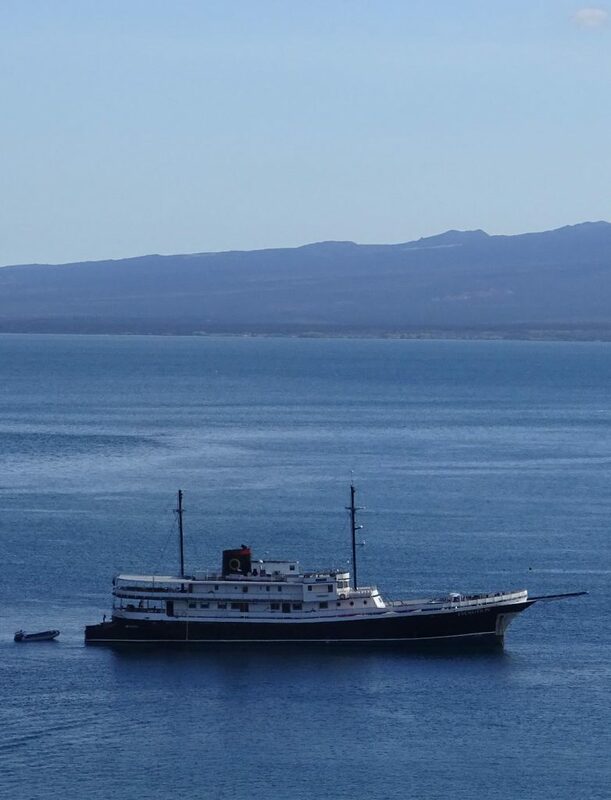 Friends of ours who sailed their own boat thorough the Panama Canal stopped in the Galapagos, figuring they could visit the islands at their leisure. However, every boat must not only have permits for the landings, but hire a licensed naturalist. They were disappointed to be relegated to the tedious day trips. The best—and in my opinion—only way to make this once-in-a-lifetime trip is to secure space on one of the approved small ships and yachts that make the trip a floating safari. The largest allowable vessels like the Celebrity Xpedition, Galapagos Legend, and Silver Galapagos carry a maximum of 100 passengers. So that the trusting animals are not overwhelmed, only small groups may be ashore in small tenders called pangas. There are no docks. You can walk onto land in some places, but you can expect many “wet landings,” where you have to be fairly spry, step into shallow water, and spash your way to the beach. The larger your ship, the less time on land because each group must be ferried to and from shore. The smallest boats—often catamarans—carry 12 to 20 passengers, plus crew and the mandatory naturalist. We decided on Quasar’s Evolution, an expedition-style small ship that offered comfortable cabins, excellent food, and a crew of 21, which included a crew director, two naturalists, and a doctor. Then we sent an email to traveling friends asking if anyone wanted to join us. In a few weeks, we had filled all 16 cabins with 32 friends and family. Don’t worry; it’s just as easy to book a cabin for two. To reduce environmental impact, the Galapagos National Park only allows a given boat to return to the same island once every 14 days. If you have your heart set on seeing the waved albatross on Espanola or the red-footed boobies on San Cristoból, you must pick both your season and itinerary carefully. One of the most thrilling aspects of the animals of the archipelago is that they are so unbothered by the presence of humans that we could get extremely close to the piles of iguanas or nesting birds without them moving an inch. They have never been hunted or harassed. Everyone is forbidden to touch the creatures, but when you are a few feet away from a mating waved albatross couple or tiptoeing around sea lions nursing their calves, you will understand the wisdom of what seems like harsh regulations. Most of the navigation to the distant islands happened while we were asleep and we were ready for our first adventure right after breakfast. Our expedition offered two different landing sites (lasting more than two hours at each location) and two snorkeling sites each day, plus there was time for kayaking and dinghy rides. Once, while leaving Bartolomé Island, our captain spied a pod of dolphins. “Head aft if you want to get closer!” he called over the loudspeaker. This impromptu trip had us in the center of at least 50 leaping and carousing dolphins in a few minutes. No large ship could possibly have organized this thrill. Another time, we were exploring the bony carcass of a beached whale on Fernandina Island when Raphael, our naturalist, spied a spume in the water. He radioed the closest panga driver who zoomed over to the beach. In minutes, we were off to photograph a uncommon sighting of an orca breaching beside us. 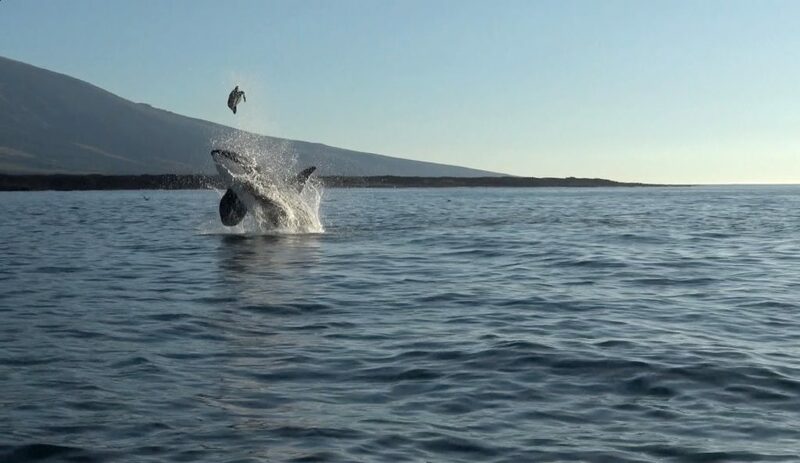 Even more amazing, the orca was tossing a large sea turtle in the air—playing with his food! “I’ve wanted to see one my whole life!” He said, trembling with excitement as the largest animal known to have lived on earth plowed through the sea. Highlights for me included snorkeling with a huge sea turtle at my side who didn’t mind my awkward fins compared to his graceful flippers. 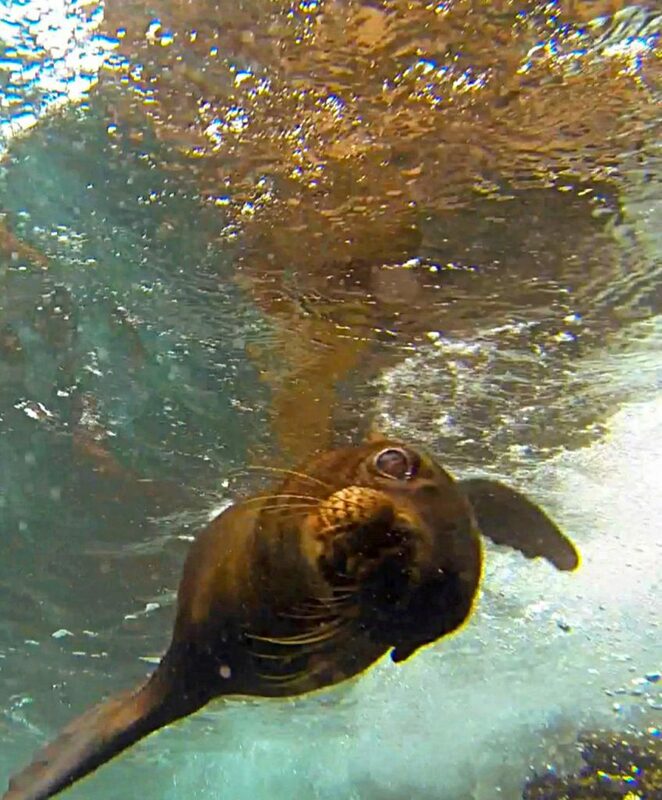 A curious baby sea lion put his nose right against my mask then posed for my husband’s camera. Then, when I looked toward land to get my bearings, a Galapagos penguin—the only species found north of the equator—waddled to the edge of a rock, dove right in front of me, and took flight underwater. No longer awkward, he became a swift ballerina of the sea. Once in the water, penguins can “fly” 20 miles an hour. Bobbing above, I felt his enchanting performance was just for me. Don’t be fooled by a bargain Galapagos hotel package or a port-to-port tour unless you would rather visit population centers than these unique animal habitats. Choosing to stay on land is like nibbling the appetizers and skipping sumptuous feast in the banquet hall. Darwin went by sea and you should too. 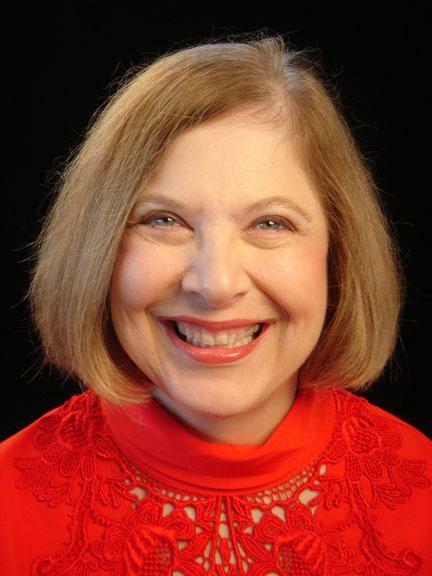 Gay Courter is a bestselling novelist (The Midwife, Code Ezra, Flowers in the Blood) and documentary filmmaker. She travels for both work and pleasure since her first around-the-world trip at age six.